In a translated statement, Guo Rui-Qiang and Jia Jing-Chuan are looking to raise the number of signatures on watchdog SumOfUs' petition to 100,000 by Thursday, which is by no coincidence the date of Apple's annual shareholders meeting, reports CNet. "We believe it'd by symbolicly (sic) powerful if 100,000 people signed the petition before SumOfUs delivers it to Tim Cook," Guo and Jia wrote. The pair's unified voice lends further gravity to the petition, as both were among the Wintek employees who experienced health issues after being exposed to n-hexane in 2009. A fast-drying chemical agent, the now-banned n-hexane was used to clean iPhone screens in place of alcohol to speed up the manufacturing process at Wintek. Previous reports claim that at least 62 workers were hospitalized after being exposed to the toxic substance in 2009. According to Wintek, those who suffered ailments related to n-hexane were given medical treatment, though the fiasco was the cause of a violent strike which was later settled with bonuses and a ban of the offending chemical. Wintek was one of the first cases that brought working conditions at Apple's Chinese partner factories to the mainstream media. "We have been pressuring Apple, and its new CEO Tim Cook, for years to compensate those of us who were injured working for them, and demanding reform of working conditions at their Chinese factories so that their workers don't suffer like we do," Guo and Jia said. "Now we need your help as customers or potential customers of Apple." 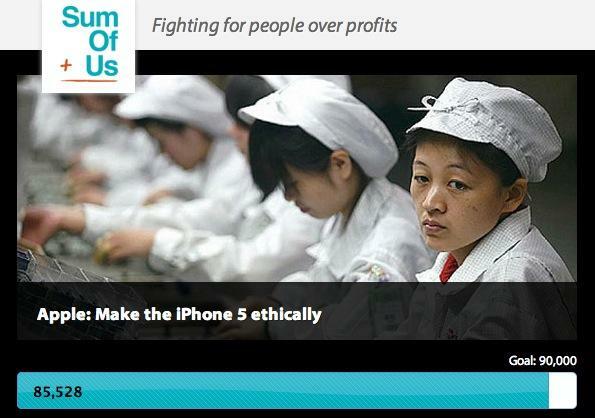 Earlier in February, SumOfUs delivered petitions from Change.org to select Apple Stores in order to raise awareness of the working conditions in the Chinese factories Apple uses to build its products. SumOfUs and Change.org said that a recent supplier audit was initiated in response to their efforts, however those claims came well after a January report that noted Tim Cook had announced plans to partner with the Fair Labor Association to conduct the check. The world's most valuable tech company has been under extreme scrutiny as of late over its use of Chinese labor, and Wednesday's announcement follows an investigation of a Foxconn factory from ABC's Nightline which showed that iPhone's are basically made by hand. Apple has vowed to keep suppliers in check, and has released through its website monthly supplier reports, the company's code of conduct and a list of suppliers and manufacturers. SumOfUs intends to deliver the petition in printed form on to numerous Apple Stores on Thursday in a "distributed" effort that involves "hundreds" of the organization's members.